Legged locomotion is about more than legs alone. Contemporary legged robots typically consist of legs or arms attached to a rigid brick-like body, but biological systems often actively bend in the body while moving — for example by bending a spine using core muscles. Biologists have documented numerous benefits of spined core actuation benefiting legged locomotion prowess but little work has been done investigating if similar benefits can be achieved in robotic hardware in an experimental setting. Challenges: Our goal is to find fundamental principles behind robotic legged locomotion using an actuated spine. We aim to both demonstrate that in certain situations an actuated spined robot morphologies are useful for agile legged locomotion as well as quantify the advantages and disadvantages of using such a morphology. 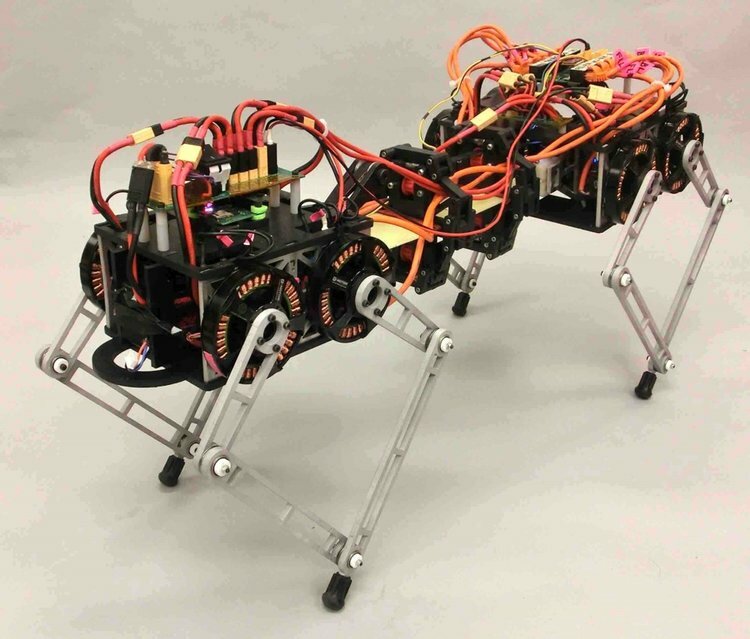 Why this research is exciting: We have built the first quadrupedal spined robot — called Inu — that runs with an actuated spine mechanism using on-board power and is published in the literature. Aside from demonstrating the running and leaping performance of our robot, our papers document several ways in which a spine mechanism can benefit legged maneuvers disproportionate to the added mass of the spine morphology, where the spine provides a greater benefit to the robot’s agility than if the added mass was instead used to power the legs. Jeff Duperret’s role: Jeff designed the Inu robot and is the primary graduate student working on the project. Currently he is working on the theoretical aspects of controlling the robot for steady-state running and agile maneuvers, and quantifying the morphological advantages and disadvantages of the spine mechanism for locomotion. UPenn undergraduates Ben Kramer and Ben Bernstein have also worked on the project.